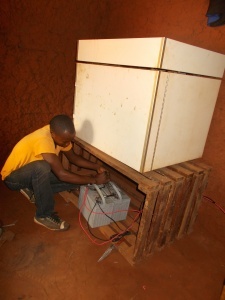 Refrigeration is an important element of rural healthcare in Congo for three main reasons. First, common vaccinations require refrigeration, and when strategically placed, it is possible for more children to receive vaccinations. Second, some important medicines need to be refrigerated. Without refrigeration, a care-provider is limited in what they can offer sick patients. Third, refrigerators are needed for blood blanks. Since some of the most common causes of death in northwestern Congo are anemia (caused by malaria) and blood loss, blood transfusions are often needed. With the funding provided by CCI partners, we have been able to order a large shipment of solar powered refrigerators that are designed for places like Congo. Additionally, our local solar technician, Gaspy, has assessed the condition of existing refrigerators. Some he determined unfit for use, while others could be repaired once he received the replacement parts we ordered. His technician team are repairing the broken refrigerators and will be installing new units once they arrive. The technicians are capable to provide ongoing service to keep these refrigerators running. We are so grateful for the good work being done to rehabilitate these refrigerators, and we can’t wait for many more new refrigerators to be installed. Thank you to our clinic sponsors! Posted in Congo Clinic Initiative, PCP Update.